Our Mission: “Provide force health protection through quality healthcare for our beneficiaries and through education and training for our staff.” Our Vision is to be the “First and the Finest”! We strive to be the first choice of patients, staff and the leadership of today and tomorrow. We are a bold and creative organization that provides unparalleled patient-centered healthcare for our national security. The Branch Health Clinic NAVSTA Norfolk is the Navy’s largest dental clinic with 116 dental treatment rooms and seven Mobile Dental Units. 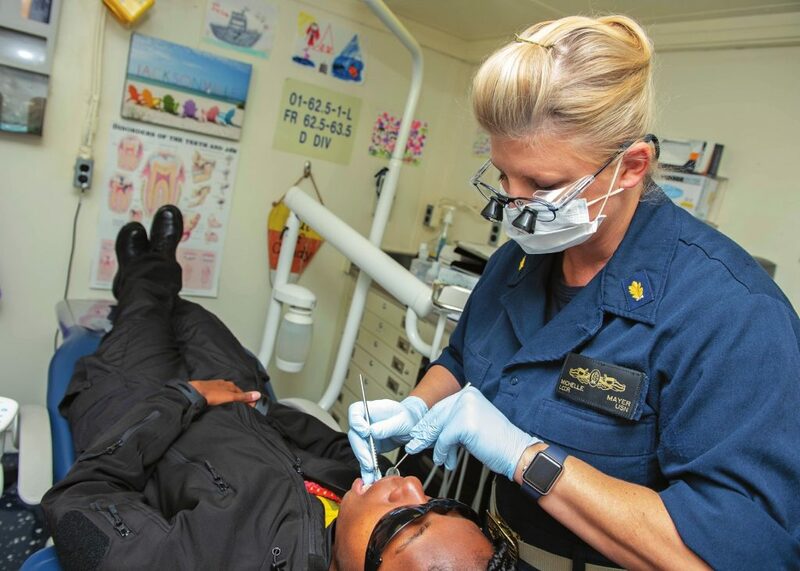 Our staff is dedicated to provide dental support to the more than 50,000 active duty Sailors and Marines in Hampton Roads. We are located at Building CD-3 outside of Naval Station Norfolk between the Commissary and Branch Health Clinic NAVSTA Norfolk Medical building. We provide therapeutic services including: Oral Diagnosis, routine dental exams and family overseas exams; general dentistry, restorative treatment; periodontics, treatment of the gums and structures supporting the tooth; dental cleanings, scale and polish teeth; prosthodontics, crowns, bridges, implants, full and partial dentures; oral surgery; routine tooth extractions, surgical reconstruction; endodontics, root canal treatment; radiology, dental x-rays; TMD, manages discomforts of the jaw joints; and orthodontics, straightens and aligns teeth. For clinic departments and appointment information call 953-8635.